Big Foot Custom Trapeze Harnesses, skippered by Nick Press’s father Murray and crewed by Scott Lanham, finished second overall, but 10 points behind, with a mixture of second, third and fourth places in their tally, Murray Press also winning the Veteran trophy. Defending champion skipper, Brett Hobson, was ashore awaiting the birth of his second child, so left Geotherm in the capable hands of James Francis and Hobson’s usual crew, Billy Lusty, who sailed Geotherm to fifth overall. It left the path somewhat clear for Press/Hay, as the two crews are highly competitive and push each other to the limit. “It wasn’t as easy as it looks on paper,” commented Gladesville skipper, Press, who went on to say that he and Andrew Hay, from Kirribilli, were pushed by their nearest opponents. Racing was abandoned on the opening day, Good Friday’, which was not so good for sailing – it was extremely light and shifty, so the 24 crews were raging to get on the water on Saturday when the two planned races were sailed in east and north-easterly winds. “We sailed the easterly course in the first race, and then the north/easterly in the second race. It maxed out at 9 knots, enough to power up with our big gear with two on the strings (trapeze),” Press said after beating Lincoln Crowne to the line by a minute and a half in the first race and his dad, Murray, by over two minutes in the second race. 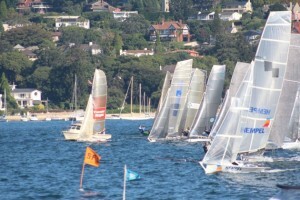 Sunday’s two races were held in easterly winds of up to 12 knots and things were livelier in terms of closer finishes. Terms & Conditions gave Sydney Sailmakers a run for their money in second race, finishing only 16 seconds behind. 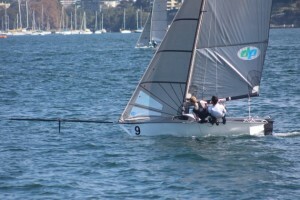 “We had really good racing with Brad and Tim,” offered Press of his fellow Lane Cove 12 Foot Sailing Skiff Club members aboard Terms & Conditions. Monday came and it was hoped two races could be held to make up for Friday’s abandonment, but the weather dictated otherwise. Crews drifted for 45 minutes waiting for the light and shifty easterly that filtered in turned to the south/east at a maximum of 8 knots. Light weather specialists Temple/Jones on Lincoln Crowne won the start and led around the course, looking unstoppable. Terms & Conditions, Big Foot Custom Trapeze Harnesses, Geotherm and Press’s crew gave chase, until Sydney Sailmakers spotted a zephyr near the finish and took advantage to win the race by 27 seconds. “It’s not over until they honk the horn – it’s still on, so you don’t give up,” Press said. The breeze died after that, so no second race. “It was a good way to end the season,” Press said. “And it was good sailing with Noddy (Andrew Hay) again. We hadn’t sailed together since the Interdominion in January. “It was good to have 24 boats on the line, including those that travelled from Queensland. They have a good fleet there, which is going from strength to strength, and we appreciate four of their crews coming to Sydney to race,” he said of those on Donkey on the Edge, Skiffropes.com, Squid and Wingman. Press, who comes from a long line of 12ft skiff champions, says only one week of sailing, at Lane Cove 12’s, his home club, remains. 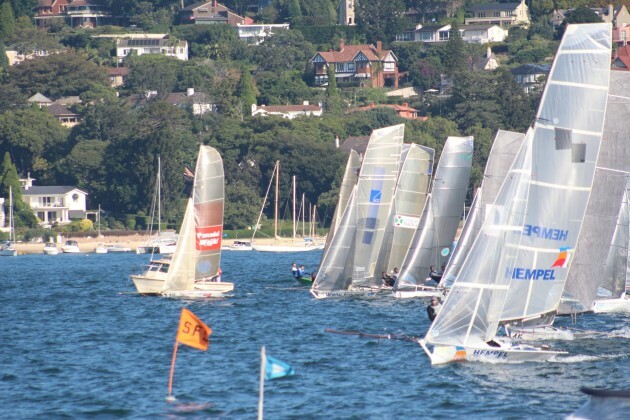 “We’ll be taking the next generation out on the water next weekend, and that’s it for the season,” said the Sydney sailor, who is proud of his sailing heritage. “I have pictures of all the Press’s (often referred to as the ‘Press Gang’, going back to my great grandfather, but I think the sailing goes back one generation further – I just don’t have a photo to confirm it,” he said. Internationally respected offshore navigator, Adrienne Cahalan, won the Handicap event with her crew Cameron McDonald. Cahalan was the only female in the 24-boat fleet and was crewed by Cameron McDonald on Panadol. Cahalan’s various other sailing commitments keeps her away from being a regular in the class, so her handicap win and 12th in the scratch results was a credit to her and McDonald. All crews enjoyed sampling the sponsor’s rum after their long afternoons on the Harbour and thanked Captain Morgan for its sponsorship of the 2016 12ft Skiff Australian Championship. 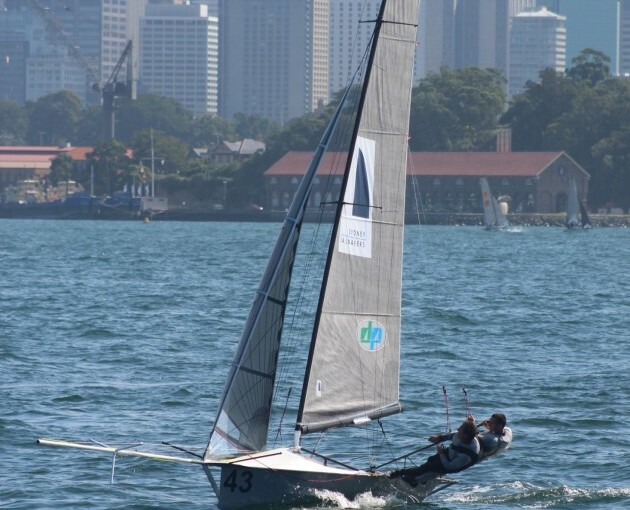 The winners of the Sydney Flying Squadron hosted Australian Championship will now have their names engraved on the Norman Booth Trophy, while the handicap winners’ names will be added to the Colin Clark Memorial Trophy. This entry was posted in News, Race Reports on March 29, 2016 by skiffed_2.